Released in 1971, Dirty Harry is a crime thriller film produced and directed by Don Siegel. It stars Clint Eastwood as the iconic Inspector "Dirty" Harry Callahan, a blunt, cynical and unorthodox San Francisco Police detective. 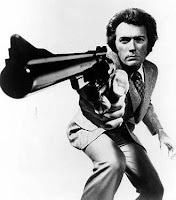 The first of four Dirty Harry movies, it set the style for a whole genre of violent cop films and helped popularize the .44 Magnum as the most powerful handgun in the world. Loosely based on the San Francisco Zodiac killings, the plot of Dirty Harry concerns a killing spree carried out in San Francisco by a psychopathic sniper known as Scorpio. Inspector Harry Callahan and partner Chico are assigned to track him down. With little regard for the niceties of Miranda rights and search warrants Harry eventually arrests Scorpio only to see him released on a technicality, prompting Callahan to utter, "The Law's Crazy". Of course Scorpio strikes again, hijacking a school bus, so Harry armed with his trusty .44 Magnum sees that Scorpio is put down once and for all. The movie is full of memorable and iconic scenes including the hold up/shootout at the beginning of the movie where Harry utters the classic, "I know what you're thinking, punk. You're thinking "did he fire six shots or only five?" Now to tell you the truth I forgot myself in all this excitement. But being this is a .44 Magnum, the most powerful handgun in the world and will blow you head clean off, you've gotta ask yourself a question: "Do I feel lucky?" Well, do ya, punk?" 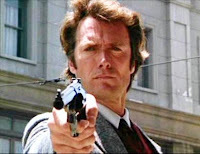 So memorable was this scene that it was used, albeit in a digital form, to trail a proposed Dirty Harry computer game, which curiously never saw the light of day. The Dirty Harry soundtrack was created by composer Lalo Schifrin, who had previously collaborated with director Don Siegel in two earlier Eastwood movies Coogan's Bluff (the inspiration for TV cowboy cop McCloud) and the strange and hypnotic The Beguiled. Hugely influential even 38 years later, Schifrin's sizzling proto Acid Jazz score for Dirty Harry fuses classical music, jazz, soul, funk and psychedelic rock to propel the screen action with powerful cues like the main title and the much sampled Scorpio's View. When Clint Eastwood finally departs this mortal coil, his legacy will live on as a master film maker, occasional jazz pianist and playing two of cinema's most enduring and memorable icons, the Man with No Name from the 'Dollar' Spaghetti Westerns and Inspector "Dirty" Harry Callahan. The 8th December 2008 was a sad day for British Television and the many people who grew up listening to the warm and relaxing tones of English animator, puppeteer and writer, Oliver Postgate who passed away on that day. Among his many many achievements were creating and narrating such TV Classics as Noggin the Nog, Ivor the Engine and The Clangers. The Clangers were a family of pink mouse-like creatures who lived on a small grey planet in outer space. They communicated in whistles, and ate green soup supplied by the Soup Dragon. Broadcast by the BBC from 1969-1972, The Clangers was a charming stop motion animated children's television series and was produced by Smallfilms, a company set up by Oliver Postgate and Peter Firmin. The evocative music for this iconic British series and all Smallfilms productions was composed and performed by bassoonist, conductor and composer Vernon Elliot who passed away in 1996. The Clangers have entered pop culture with plush toys still available in UK high street shops. In the late 1980s and early 1990's a Scottish alternative rock band called The Soup Dragons covered the Rolling Stone's I'm Free. In an old Doctor Who episode "The Sea Devils" there is a curious cameo where The Master is seen watching The Clangers on TV while in prison and believes he has picked up some extra-terrestrial broadcast and claims to understand their curious whistling dialogue! Cuuuute! For certain Brits who grew up in the 1960's and 70's, The Singing Ringing Tree occupies a special place in their hearts. Just the mention of it provokes avid discussion about school holidays, White Horses, Robinson Crusoe and a certain evil dwarf. 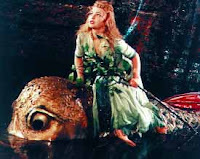 So what is it about this 52 year old East German fairy tale that remains in the memories of so many people? The story follows the exploits of a prince who asks for the hand of a beautiful but spoiled princess. She rejects his gift of pearls and demands instead a magical tree - the titular Singing Ringing Tree. The Prince goes off in search of the tree and eventually finds it at castle with an enchanted garden ruled by an evil dwarf who offers the tree to the prince at a price. If he fails to win the love of the princess he must return to the garden and the dwarf. Like all fairy tales there's always a bit of suffering and the princess rejects the prince's gift and the poo r lad gets turned into a bear for his trouble and the princess gets ugly as a result of a nasty old spell cast by the dwarf. The Bear carries the princess off back to the Dwarf-realm. Despite being dumped on at every opportunity by the dwarf, the Princess learns to love and with the help of some downright weird animals in the enchanted garden she overcomes the dwarf's power. As a result she gets lovely again, the bear turns back into a prince and the Singing Ringing Tree sings and..er rings and they all live happily ever after. So what's so bad about that? Well nothing really when you look at it in the cold light of day, but somehow the presentation on screen traumatised a generation and probably didn't help people of restricted growth integrate too well into society at the time. 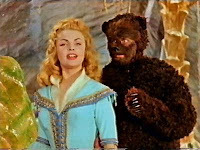 Made in 1957 and first screened in Britain in the Sixties by the BBC as part of its Tales From Europe series, The Singing Ringing Tree (aka Das Singende Klingende Baumchen) was made in the former East Germany and directed by Francesco Stefani with music by Heinz-Friedel Heddenhausen. Generously funded by the state, the Singing Ringing Tree was filmed in almost lurid colour with top quality production values for the time. Although originally filmed in German, the BBC added an English voice over to describe the action as it unfolded on screen. Whilst this idea was no doubt to save money by the strapped for cash BBC, the calm relaxing voice only accentuated the fairy tale aspect. It certainly needed to, as the dwarf was downright nasty and deeply scary and probably accounted for many a sleepless night. Apart from the stunning visuals, a crucial aspect of the film was its score. Much of it is lush and romantic yet there are parts that are haunting and mysterious - particularly the scenes in the dwarf realm. Unlike the film itself, The Singing Ringing Tree score has never been released commercially but is a joy to listen to and may just have you hiding behind the settee or sobbing when you hear the tinkly theme tune.